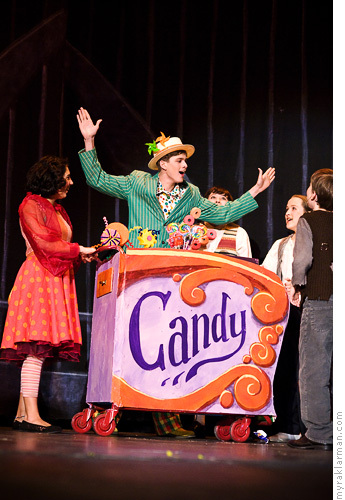 Willy Wonka (Max Rasmussen) was portrayed deliciously with equal portions of deviousness and charm. 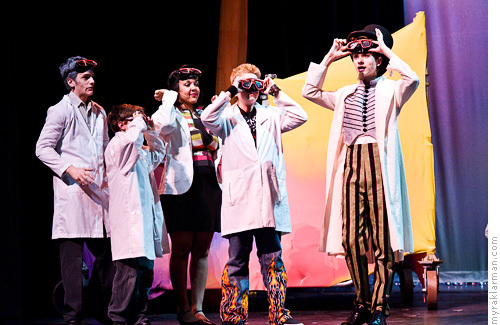 Pioneer was selected to prototype and fine-tune (a process known as “workshopping”) a new stage adaptation of Charlie and The Chocolate Factory before it becomes available for license to theatre groups worldwide. The honor was not without major challenges, though — such as receiving the script and score in piecemeal chunks over the weeks leading up to opening night. 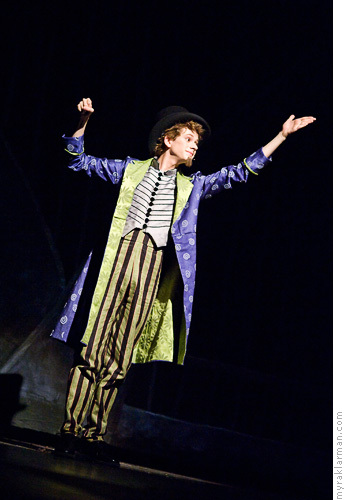 The show is also a major technical undertaking: anyone familiar with the story knows how much it relies on the adept execution of illusions and special effects. 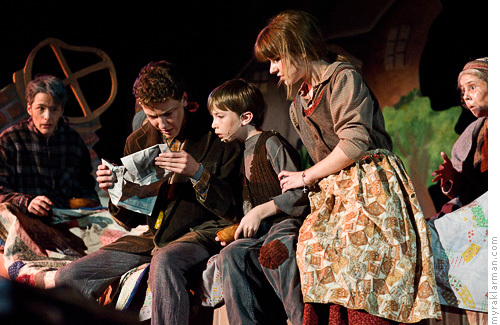 And as if that weren’t enough… the show also includes nearly 100 27 elementary school children (they appear throughout the show in various roles so seamlessly that I actually thought there were almost 100 of them). 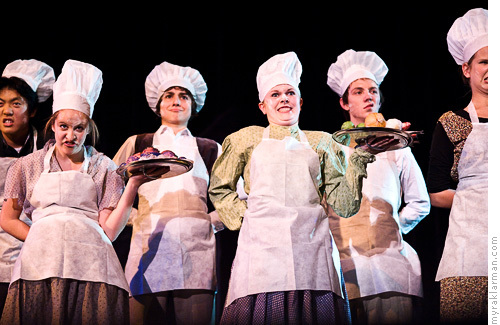 The show’s directorial staff includes four students from the University of Michigan School of Music, Theatre & Dance: Etai BenShlomo, Clark Baxtresser, Sarah Yarrington, and Gavi Savit (all but Etai are recent Pioneer alumni!). Mr. and Mrs. Candyman (Daniel Mozurkewich and Sonya Major) can. 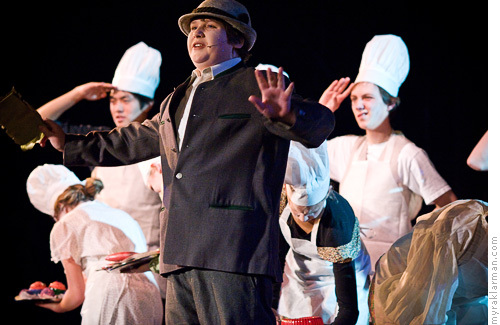 Augustus Gloop (Kiel Lerch) and the ensemble: I Eat More. I love the sinister expressions on their faces. Mike Teavee (Schuyler Robinson) is fierce! 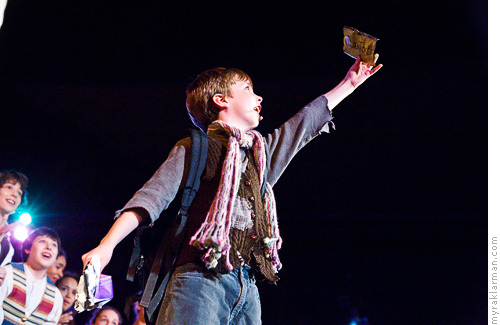 Charlie (Milo Tucker-Meyer) has a golden ticket! And he’s sure to steal your heart. 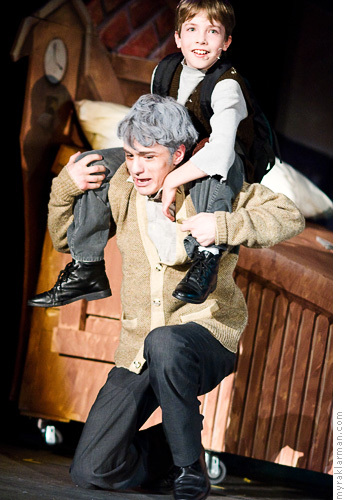 The theretofore bedridden Grandpa Joe (Sam Hubbard) accompanies Charlie (Milo Tucker-Myer) to Wonka’s factory. 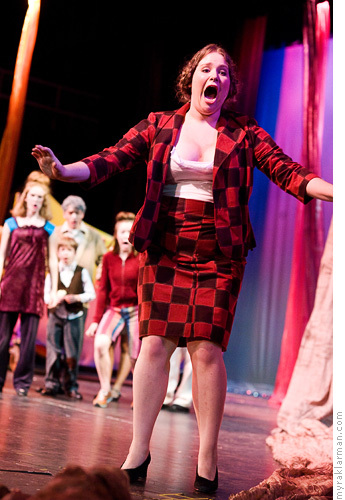 Mrs. Gloop (Zoë Berman) is in hysterics when Augustus falls into the chocolate river. 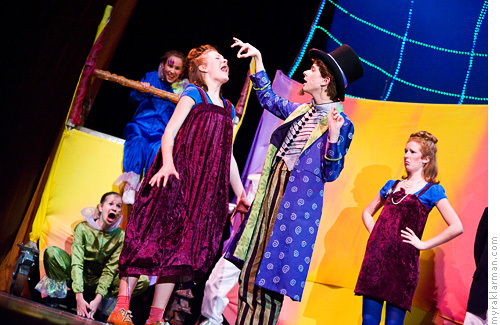 Wonka (Max Rasmussen) tempts Violet Beauregarde (Clare Eisentrout) with his irresistible, multi-course gum. 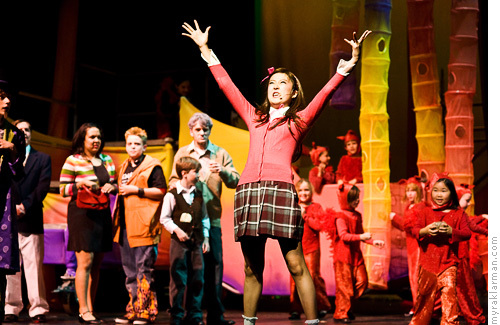 Veruca Salt (Ashley Park) wants it all! We love you, Myra! These are fantastic! Myra! These pictures are beautiful, and capture every possible detail. Thank you so much for these fantastic photos!! You’re very welcome — it’s a labor of love! Hold the chocolate! According to my site log, many, MANY more people visited Relish today than on any other day — ever! Wow! Ahaha… Myra, these are wonderful. :) I’m so glad you were able to come back for the REAL costumes, sets, etc. And is it true that Max is coming on Saturday? I can’t wait for him to see the show. Thanks again! HI! these look great! 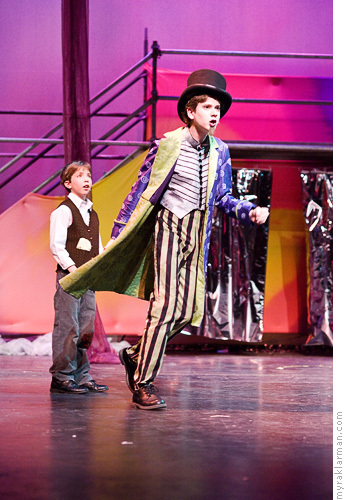 I miss Wonka.